In the southern part of Italy lies the more obscure wine producing region of Campania where the Feudi di San Gregorio estate resides. This exciting and dynamic house has a focus on innovation and a sharp eye on quality. The estate has some of the oldest vineyards in all of Italy with records showing wine being made in this part of the Irpinia region as early as 590 AD. Spread out over lush and gentle hills in Sorbo Serpico, an hour from Naples and Mount Vesuvius, its unique volcanic, sandstone and marly soils lends to great wines with the telltale aromas of cherry, cinnamon, aniseed, graphite and ash. Founded by the husband and wife team of Enzo Ercolino and Mirella Capaldo in the mid 1980’s, the estate has gone from strength to strength due to their excelelent quality wines made from indigenous grapes Fiano, Aglianico and Greco di Tufo. Join us and Jennifer Klinck of Vendemmia International Wines as we welcome Maurizio di Rosa, the Export Manager for FDSG and taste and discover Feudi di San Gregorio. Our thanks also to Daniel Costa of Red Star who is from Campania and will be doing local fare from the region for this tasting. Only 18 seats available for this special event. 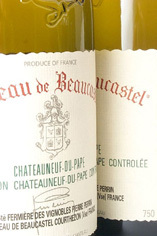 This past week’s Top Drops Beaucastel tasting revealed a remarkably consistent house, the Beaucastel rouge reds were not as bretty as some in the past with the 1997 at peak and a full blown aromatic nose of earth, figs, bog and prunes, the palate was fully resolved and drinking well. 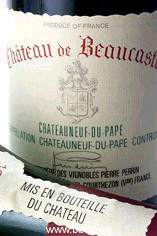 The 1999 can still use a little more time although with an hour’s decant revealed it was in a drinkworthy phase. The sublime 1998 has been a superstar all its life and this was a particularly good showing, displaying secondary aromatic complexity with a long, lingering finish of dried dark berries with noteworthy finesse and class. The younger Rouges were interesting to taste as it provided a reference point to what some aging will do, the 2005 (a bit closed down but with a gratifying combination of blackberry fruit and strong ageworthy tannins) while the 2007 hasn’t yet started its hibernation and was a deep deep color of purple hues and gushing black and red berry fruit, anise, figs and spice – some of us who tasted the 1998 young think the 2007 is a superior wine at the same stage and given the status that the 1998 has achieved, this is a must purchase vintage, and we have 375mL, 750mL’s and1.5L magnum formats available now. Get these before the Wine Specator’s Top 100 announcements are made. The 2003 Hommage a Jacques Perrin was the wine that threw the most sediment of all the wines and it is showing magnificently now. Wow, time flies…Thanksgiving is fast upon us already, so here are our picks to accompany the classic turkey and ham dinner with all its fixings. Start your evening off with a sparkling wine, followed by whites, reds and finally ending with a dessert wine and/or port. Sparkling wines are a great way to start any function whether its a greeting aperitif and equally fabulous to pair with assorted appetizers (you know the saying if you don’t know what to pair with something, go with bubbles). There are so many choices but here are three very different recommendations: The Canella Prosecco di Conegliano from Italy is both well priced and delicious with lively citrus notes and delicate bubbles and is a deVine Bestseller. The unusual Cabernet Franc based sparkling red from Chateau Langlois Carmin Dry from the Loire Valley can work with meat based appetizers or for the adventurous used in conjunction with the roasted turkey as well – the foamy red notes go great with the cranberry sauce – this is a variation on the Aussie sparkling shiraz theme. For those who want the best, a couple of recommendations in French Champagne – the NV Le Brun Servenay Brut is rich and generous with that toasty bread notes while the vintage dated 1998 Veuve Clicquot La Grande Dame is world renowned and certain to impress with both contents and the amazing packaging. Whites with a touch of sweetness is preferred because of the sweetness of some of the fixings – candied yams, cranberry sauce, and honey for the glazed ham. A completely dry white will seem more austere and void of fruit due to the sweetness of the food so I recommend Rieslings, Gewurztraminers or other Germanic or Alsace varietals. The Francois Lichtle Riesling from the Alsace has just the right amount of sweetness, along with the apples, pears and peach notes. The bargain priced Cono Sur Gewurztraminer is very good with its gardenia notes, lychee and rose accents will be pleasing.